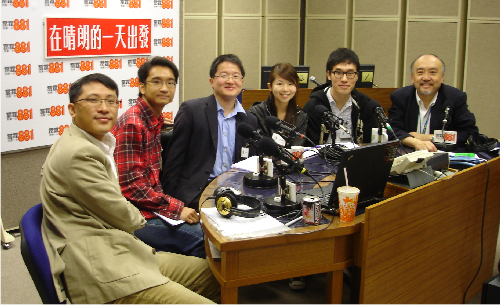 A team of Electrical Engineering Year 3 students: Lee Lap Cho Eldon, Wong Tsz Chung Peter and Li Wing Yiu, and their supervisor Dr. Wilton Fok were interviewed by the Commercial Radio Hong Kong in a live broadcast program “881 Clear Day在睛朗的一天出發” in the morning of 25th February 2009. The team had won the Silver Award in the HSBC Young Entrepreneur Award 2008 and the Silver Award in the National Challenge Cup 2008 for an entrepreneurial idea to create a business in “Green Roof Engineering”. Recently, this idea has raised a lot of public interests and the team was invited to share their views and suggestions with the public through the air. During the interview, Eldon Lee introduced the background of the project. Peter Wong mentioned the financial budget and estimated the possible number of new jobs can be created by this new business while Li Wing Yiu introduced the technical, social and environmental benefits of such a green roof engineering project. At the end, Dr. Fok encouraged all students in Hong Kong to be proactive and innovative in their career development: “Instead of waiting for chance to come, we could be more proactive in creating new opportunities for our future.” The sound clip of the interview can be downloaded here.